"I grew up in Chula Vista, two miles north of the U.S.-Mexico border. Vigilante, murderous white people were shooting at families crossing the border. My parents told me we have a responsibility to take care of our community; so I registered voters and campaigned against anti-immigrant ballot initiatives." After enrolling at UC Berkeley in 1996, Gonzáles met Harmony Goldberg and Rona Fernandez, was radicalized and decided that fundamentally changing the system required her to do more than vote. 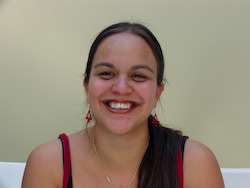 Around 2002 Genevieve Gonzáles, took over as SOUL's Bay Area director, freeing Harmony Goldberg to expand the organization at the national level. "We are a school to build a movement -- like the Highlander Center in Tennessee,"
"It sounds simplistic, but everyone deserves to have what they need -- we are talking about creating a society where no one goes hungry." In 2006 the Women of Color Resource Center Board of Directors includedCaroline Acuna-Guilartes, Linda Burnham, Jung Hee Choi, Angela Davis, Derethia DuVal, Chris Lymbertos, Genevieve Negron-Gonzales, Margo Okazawa-Rey and Cindy Wiesner. Those invited, on Facebook included Genevieve Negron-Gonzales. This page was last modified on 21 November 2016, at 11:18.